There are totally 2 maxillae, 1 on every side of midline. The 2 together create the upper jaw. They have uneven pneumatic bone structure. It is the second largest bone of the face. It consists of 5 parts: a body and 4 processes. It makes the lateral wall of the nasal cavity and represents the base of the body of maxilla. It presents a large opening, the maxillary hiatus, which leads into maxillary sinus, a large air space inside the body of the maxilla. The maxillary hiatus is the most notable characteristic of the nasal surface. In the articulated skull the maxillary hiatus is reduced in size by the 4 bones, viz. ethmoid, lacrimal, inferior nasal concha and palatine. In front of the hiatus is the nasolacrimal groove. It’s converted into nasolacrimal canal by lacrimal bone and inferior nasal concha. An oblique ridge present in front of the nasolacrimal groove is termed conchal crest. It articulates with the infe-rior nasal concha. A vertical groove, running obliquely in the posterior part of nasal surface is converted into greater palatine canal by a perpendicular plate of the palatine bone. It creates the major part of the floor of the orbital cavity. It presents infraorbital groove and canal for infraorbital nerve and vessels. It creates the anterior boundary of infratemporal fossa. It’s divided from the anterior surface by zygomatic process and bony ridge (jugular crest) that ascends to it from first molar socket. It presents few tiny foramina for posterior superior alveolar nerve and vessels. It creates the part of norma frontalis. About 1 cm below the infraorbital margin, the anterior surface presents the infraorbital foramen which carries infraorbital nerve and vessels. 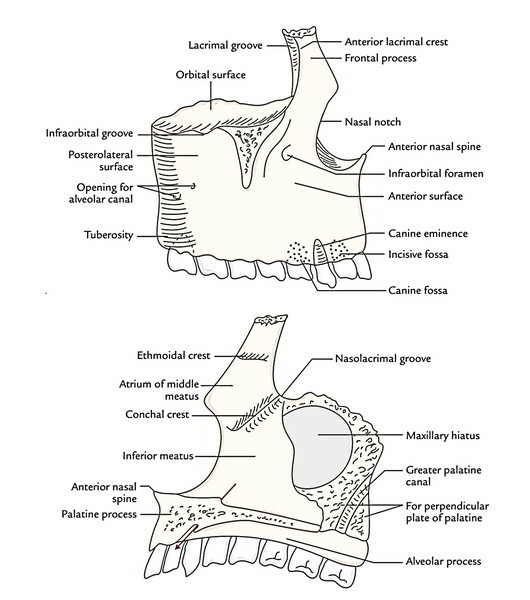 Just above the alveolar process the anterior surface gifts from medial to lateral: incisive fossa, canine eminence and canine fossa. The canine eminence is caused by the root of canine tooth. It projects upwards and articulates with the frontal bone. The thick frontal process is located in the line of buttress for dispersion of force of impact from teeth to the base of the skull. Its lateral surface is split into anterior and posterior parts by a vertical ridge referred to as anterior lacrimal crest. The posterior part is grooved and creates a part of lacrimal fossa. The medial surface of the frontal process is marked by a horizontal ridge named ethmoidal crest. It slopes downwards and forwards and articulates with the middle nasal concha. An area below the ethmoidal crest creates the atrium of the middle meatus. It stretches laterally to joint with the zygomatic bone. It goes horizontally in the direction of the medial side and creates the greater part of the hard palate. It goes downwards and bears the upper teeth. It’s arched, being wider behind, to create the alveolar arch. The 2 maxillae are combined in the anteromedian planeat the intermaxillary suture. The portion of the maxillae that carry the incisor teeth is occasionally called premaxilla. Le Fort I: In this a horizontal fracture runs along the floor of the nose above and parallel to the palates and below the zygomatic bone. Le Fort II: In this, a pyramidal-shaped fracture line goes through the root of the nose, floor of orbits and after that runs medial to and below the zygomatic bones in the direction of the alveolar margin. 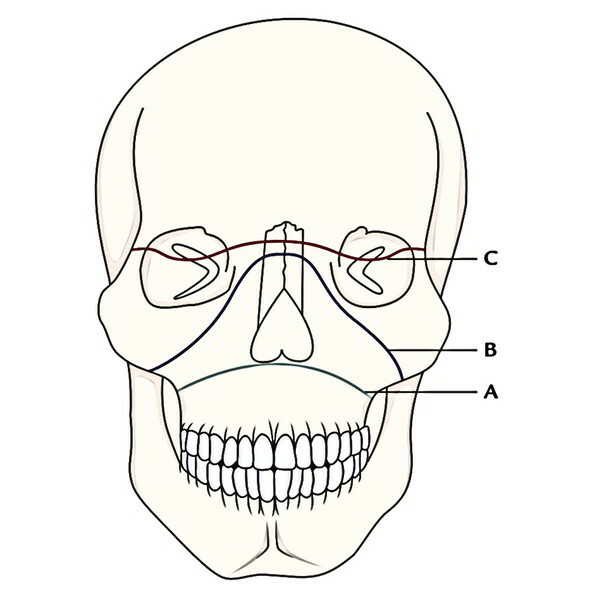 Le Fort III (craniofacial dysfunction): In this, the fracture line runs via the root of the nose, superior orbital fissures and lateral walls of the orbits above the zygomatic bones. There’s complete separation of cranial skeleton from facial skeleton.